Manufacturer: Dynavector - available by mail order from Precision Enterprises Unlimited (802) 885-3094. Decals: One aircraft from 831 Squadron on HMS Eagle at Suez, 1956. Hey! Just because I said the dread word "vacuform," drop that garlic necklace and put down your crucifix. This is an interesting model. Try it, you'll like it. The Westland Wyvern was the Fleet Air Arm's attempt to create a single-seat strike aircraft similar to the Douglas AD Skyraider. Begun in 1944, in 1946 the aircraft was re-engined with one of the first turboprops, a decision that led to an 8-year development delay. The Wyvern entered service in 1954, semi-obsolete at the outset, and had left FAA service by 1957. 9 aircraft of 831 Squadron actually saw operational service aboard HMS "Eagle" during the abortive Anglo-French Suez Intervention in October-November 1956, losing two aircraft to Egyptian AAA during four days of operations. I first became aware of this airplane in childhood, when I read William Green's "1955 Aircraft of the World." The airplane's shape attracted me and I have always wanted one in my collection. 20 years ago I built Frog's 1/72 kit, and ten years ago did one of the terrible ID Models vacuforms. I saw a completed Dynavector kit at ValleyCon a few years ago, and when I saw the Precision Enterprises Unlimited ad in "Fine Scale" back in 1995, I ordered one. Dynavector's kit is likely to be the only good 1/48 scale kit of this relatively-obscure airplane ever available. As a vacuform, it is state of the art: two large thick sheets of plastic with the basic airframe - fuselage halves, wings, horizontal stabilizer, all with nice engraved panel lines. With a bit of sanding and test-fitting, you get a nice looking airframe. The landing gear and propeller blades are white metal, as is the Aeroclub ejection seat and instrument panel. The multi-part spinner (it's contra-rotating) is cast resin. Be careful with the propeller Blades. The blade base will break easily, leaving you with no alternative but to contact the nice folks at Precision Enterprises and wait while they contact England and get you replacements. I speak from experience here. Once you have eight good blades, everything looks fine. The instruction sheet shows a painting diagram to do a yellow-and-black striped Suez participant from 831 Squadron. The upper wing insignia goes over these stripes, and I recommend a backing decal inasmuch as the kit decals are thin enough for the lower color to show through. The kit does not provide underwing ordnance. The Wyvern could carry bombs, a torpedo on the centerline, or (more usually) 16 RPs in double racks, eight rockets on four racks per wing. I had to wait to arm my Wyvern until Airfix released its Spitfire 24s last year; two kits provided the necessary rockets and the airplane was finally armed and dangerous. Alternatively, one could use the rockets that come with Academy's new Hawker Hunter, but the old World War II-style rockets in the Airfix kits look right according to photographs. If you are a Fleet Air Arm fan and want to do the major (and otherwise non-existant) post-war aircraft from that air arm, then get used to vacuforms. 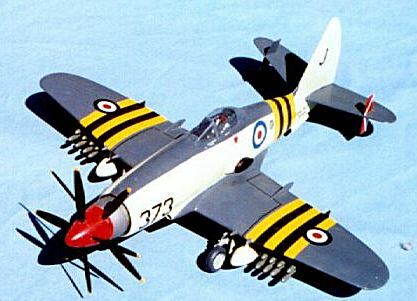 Dynavector also does the Fairey Gannet, the DeHavilland Sea Vixen, and the Supermarine Scimitar, while Falcon in New Zealand does the Hawker Sea Hawk and Supermarine Attacker, and Aeroclub may have already released their DeHavilland Sea Venom FAW-22 by the time this review is published. They're all vacuforms, and all from companies that know what they're doing in this medium. The Wyvern is a good place to start, as it is an easy vacuform that will give you a model people will comment on when they see it. One "knowledgeable modeller" I know argued for 20 minutes at ValleyCon VI that the Wyvern sitting on the table in front of him was a "fantasy airplane." You can have fun with this model!